The St. Regis Lakes are located in the northern part of New York's Adirondack State Park. The chain consists of Upper Saint Regis, Spitfire, and Lower Saint Regis Lakes, the latter being the home of Paul Smiths College. All three lakes are populated by year-round residents, though the community peaks during the summer months. The lakes' outlet drains into the St. Regis River, and flows north into the St. Lawrence. Note that there is no public water access off Route 30 between Upper St. Regis Landing and Paul Smiths. All roads along this stretch of Route 30 are private (no public access). All three lakes are used by numerous watercraft, including motorboats, outboards, guideboats, canoes, and sailboats. So that all may continue to enjoy the lakes in safety, in addition to the Navigation Laws of New York State, there are some local rules that you will want to know about. All boats should be washed, and all water, plant material and fish removed before launching in the St. Regis Lakes. Destructive plants such as Eurasian Milfoil can be transported by boat, and will quickly ruin these lakes if allowed to get started. All residents and future visitors will appreciate your cooperation. 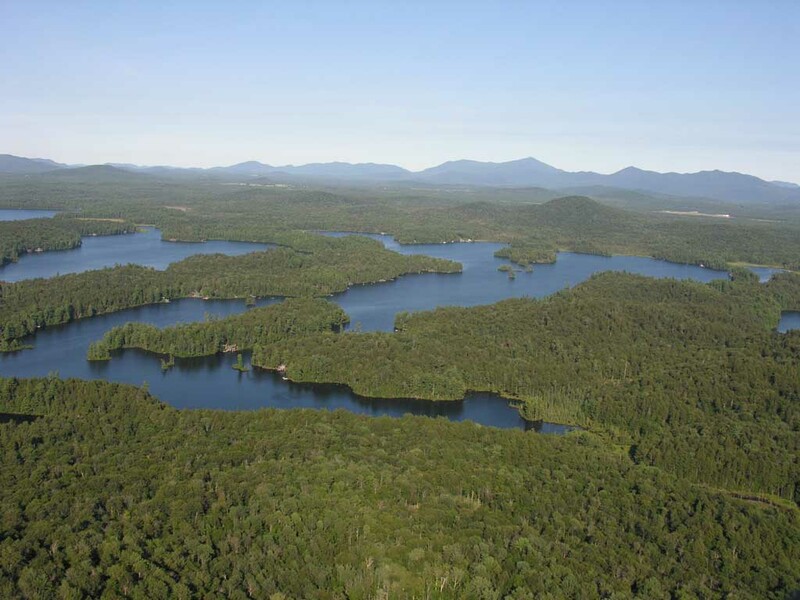 A steward from the Adirondack Watershed Institute is usually at the Upper St Regis Landing and can answer any questions you may have about the invasive species problem in Adirondack lakes. The public dock and launching ramp at Upper St. Regis Landing is on the right as you drive in by car, and on the left as you approach by water. All other docks are for the use of members of the St. Regis Property Owners Association. On yacht racing days, all motorboats and other non-participating craft are asked to stay well clear of the course, and make no wake. Races are organized by the St. Regis Yacht Club and scheduled in August on Upper St. Regis (usually starting at 3PM), and on Spitfire on Sunday afternoon, and at other times as posted at Upper St. Regis Landing bulletin board. By law, motorized vessels must yield right of way to sailboats. NY State law sets a speed Limit of 5 MPH within 100' of shore. Note that the channel between Upper St. Regis and Spitfire is a marked NO WAKE ZONE.. So you must slow to 5 mph when navigating this channel. "No wake" is defined as "The slowest possible speed required in order to maintain steerage and headway." It is unlawful to create dangerous wakes, and the boat operator is responsible for personal injury or damage caused by his/her dangerous wakes. Canoes, rowboats, kayaks, guideboats, and other human powered boats are also asked to stay clear of the race course during yacht races, and observe the privacy of land owners. Note that all islands are privately owned, as is most of the shoreline. There are no public camping or picnic areas on Upper St. Regis or Spitfire Lakes. The closest are in the St. Regis Canoe Area, which is accessable via the Bog Pond carry, .6 miles NW of Upper St. Regis Landing. The carry is located in a bay between two private camps. There is no dock at the carry.